The British Council had announced the names of the global winners of the Study UK Alumni Awards. A graduate of City, University of London, Jose Ignacio Valenzuela, was one of the trio of winners. The three winners were chosen ahead of more than 1,700 other applicants from 123 countries from more than 140 UK Higher Education Institutions. The awards, divided into three categories, highlight outstanding achievement and showcase the impact and value of completing higher education in the UK. The three award categories included Professional Achievement, Entrepreneurial, and Social Impact. Jose Ignacio Valenzuela (MSc Health Informatics 2006) from Colombia was recognised with the Entrepreneurial Award. Successful applicants in this category are active in initiating, or contributing to, creative and innovative solutions or business opportunities with strong growth prospects. 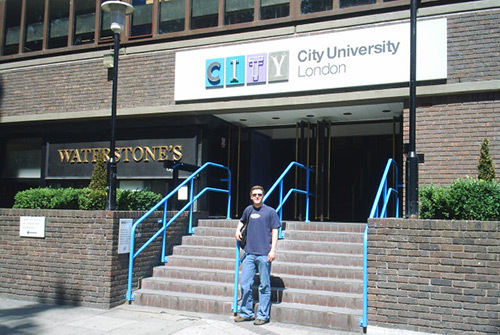 Jose is pictured, right, outside the old main entrance of City, University of London in 2006. Jose is a pioneer of Health Informatics in Colombia and Latin America: he was the first person in Colombia formally trained in this field. His work led to the first health eLearning programme in the country and the creation of ‘Doctor Chat,’ the first medical orientation service in Latin America. According to judges, his contribution to Health Informatics is changing the way Spanish-speaking communities around the world can access necessary healthcare. In the UK, Jose was able to combine his passion for IT with his profession in medicine. London’s diverse cultural environment helped him formulate new ideas and perspectives and think on a global level. My time at City was a once-in-a-lifetime experience. The education I received and its multicultural environment opened my mind radically. It filled me up with ideas, it changed my way of thinking and it reshaped my mentality to break paradigms. Coming back to Colombia with a title from City empowered my voice, and allowed me to become a pioneer in the field of health informatics in my Region. As a Colombian and City Alumni, I'm proud to being able to bring a contribution to my people through the power of innovation, and to serve as a representation of the value an excellent education can bring to humanity. The British Council announced the names of outstanding regional winners of the Study UK Alumni Awards, including Jose, in April. A second graduate of City, University of London, Isabella Cota was also included on the elite list in the professional achievement category. Isabella Cota (Erasmus Mundus Journalism & Media 2010) from Mexico was awarded a Professional Achievement Award which recognises alumni who have distinguished themselves through exemplary leadership and achievements in their professional industry. 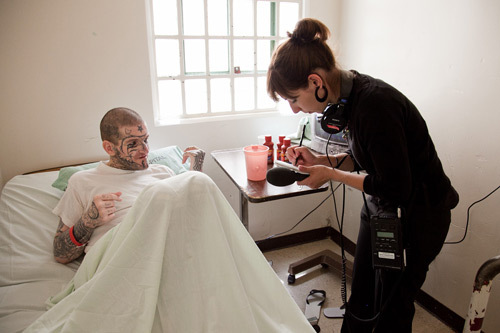 Isabella is pictured, right, reporting in California. As a Bloomberg News correspondent and fixed income reporter, Isabella has influenced the way foreign exchange is reported in Mexico and highlighted issues with the banking sector. Isabella says studying business and financial journalism at City, University of London changed her life. She learned how to approach the global financial system, as well as critical skills for accurate business reporting, and landed her first job at Thomson Reuters as a consequence of her studies in London. My highest point in my UK education was my first class with Tony Bonsignore (a financial reporter for the BBC); it was the very moment when he asked us to question whether the current financial system was functional. He asked us to do something that I had never been asked to do in class and I knew at City University London I would learn to question everything. And I most certainly did. The 21 award regional award winners were announced on Study UK social media channels in April and will be celebrated for 21 days, each day featuring a new story of an outstanding and inspirational alumnus of a UK university, and how their UK education has changed their life and made an impact. Now in its fourth year, the Alumni Awards 2018 received more than 1,700 applications from international UK alumni in a record 123 countries, representing more than 140 UK higher education institutions across the UK. Following several rounds of judging panels, regional and then global award winners were selected for the three award categories: Professional Achievement, Entrepreneurial, and Social Impact.